Known to me only from the literature. Pileus up to 9 cm, convex to flat-convex, usually smooth, greyish pink, flesh-coloured, pale pink, brownish or ochraceous, usually with more or less developed pink or olivaceous tint, in places spotted reddish brown, blueing when bruised. 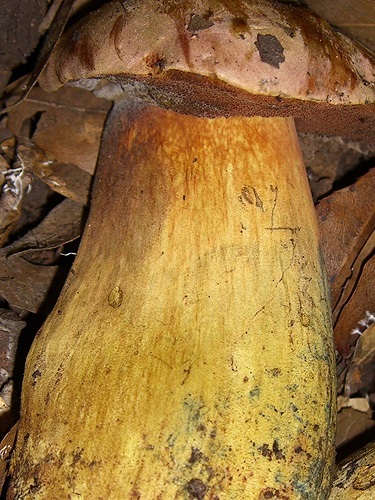 Stipe cylindrical or club-shaped, sometimes rooting, pale yellow to bright yellow, usually gradually darkening downwards to yellowish orange, orange, orange red, red to vinaceous red, in the uppermost part just below the tubes sometimes with short fine network, covered with very fine yellow, pale orange, orange, reddish orange or pale red granules; stipe surface blueing when bruised. Flesh pale yellow to lemon yellow, spotted dark red to vinaceous red in the stipe base, bleuing when exposed to air. Tubes pale yellow to yellow with olivaceous tint, blueing when injured. Pores red to orange red, blueing when bruised. Smell not distinctive. Taste not distinctive. Spores 10.5–13.5 × 4.5–6 μm, ratio 1.8–2.2. Pileipellis (the cap cuticle) a trichoderm, composed of hyphae of cylindrical cells; some hyphae encrusted. Chemical reactions: hyphae of the flesh in the stipe base amyloid in Melzer’s reagent. Habitat. Warm broadleaf forests, usually on sandy soils, mycorrhizal with oaks (Quercus). Distribution. In Europe so far known only from the Mediterranean area (Italy, Montenegro, Spain). Recently spotted also in Israel. Similarity. 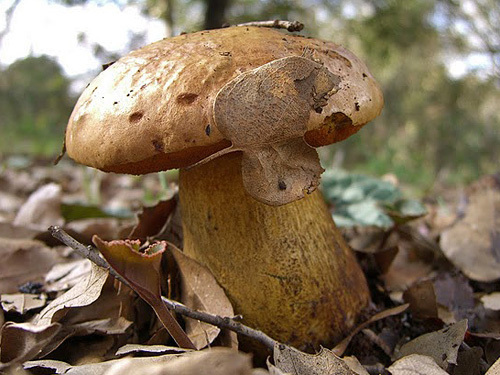 Boletus comptus shares a lot of features with B. luridus and B. queletii. 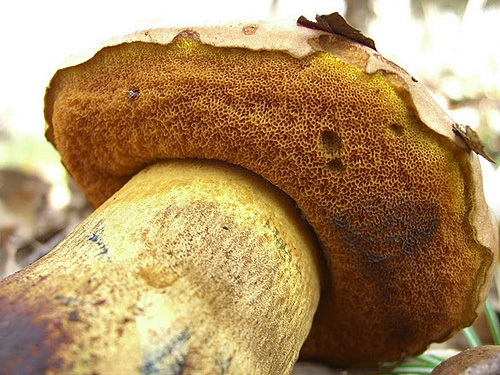 From Boletus luridus it is distinguished primarily by the yellow flesh (not orange to red) when the tubes are removed, as well as by the network which is poorly developed in B. comptus. A little bit more difficult is the distinction from B. queletii, which also has yellow subhymenophoral surface. 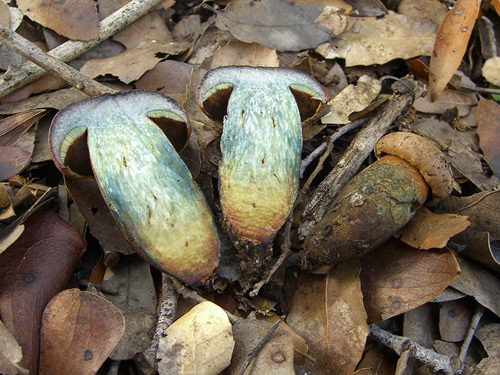 This fungus however rarely shows cap coloured in this range and its surface is normally finely velvety rather than smooth as in B. comptus. Additional macro and microscopic photographs are available at Acta Fungorum. Lunghini, D. & Perrone, L. 2002. 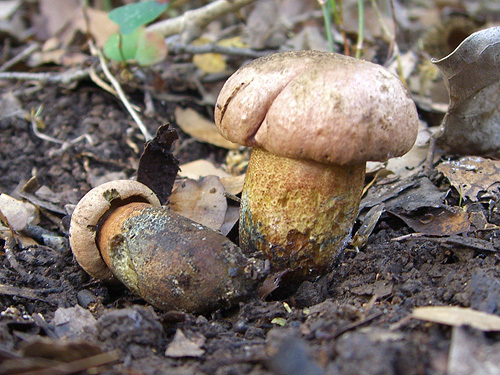 Contributo alla studio e al monitoraggio delle Boletaceae del litorale Laziale. 2. – Bolletino dell’Associazione Micologica ed Ecologica Romana 17–18: 39–60. Simonini, G. 1992. 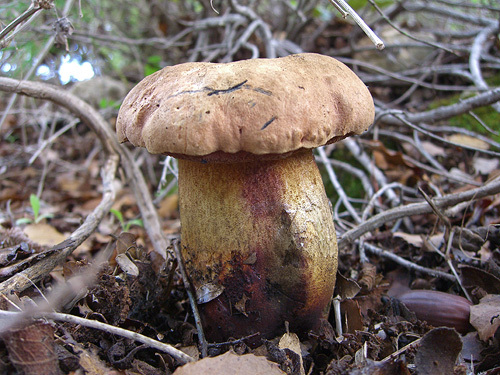 Boletus comptus sp. nov. – Rivista di Micologia 35(3): 195–208.